Can better skin and a healthier body be as simple as slapping on a sticker? Home / Health / Body Vibes: Can better skin and a healthier body be as simple as slapping on a sticker? Body Vibes: Can better skin and a healthier body be as simple as slapping on a sticker? I have held on to this particular review for a very, very, VERY long time. The problem is when you are dealing with things like energy healing, it’s very difficult to quantify the results. One person’s heart chakra may be another person’s hogwash. So, how do you validate? But after trying Body Vibes in my own personal version of evidentiary testing, I am a believer. Absolutely. Unequivocally. So, what exactly are these stickers that are popping up on everyone, right from It-girl Caroline Vreeland to nutritionists like Elissa Goodman? What in the world is Body Vibes? To understand Body Vibes, one needs to understand the concept of vibrational frequencies. As Albert Einstein said, “Everything in life is vibration.” Including us. Humans function most optimally when our internal frequency remains between 62 to 72 hertz. Over a period of time, lower or denser frequencies make you feel like something is “off” in your body or your head. Cue lowered immunity, headaches, stomach upsets, lethargy, restlessness, anxiety, achiness, irritability, skin issues… you know, that sensation when you just don’t feel good but can’t figure out why? It’s often because our bodies have been thrown off their ideal vibrational frequencies as a result of illness, inadequate diet, stress, exhaustion, or even pure sensory overload. The Body Vibes stickers, for all their style cred, are more function than form. Each 1-inch piece of prettiness is actually a radio frequency enabled disc made from a special poly/Mylar carbon fiber blend that’s programmed with specific frequencies by an accelerated frequency generator machine. Every Body Vibes sticker is programmed with a specific frequency that helps target vibrational imbalances in the body. My personal favorite is Flower Power, which is imprinted with frequencies from the hemp plant (784 hertz) to help you loosen up and unwind. Flower Power is the one I have found myself reaching out for the most in the last few weeks, as life has led me down the screechy end of the wire. Things have seemed pretty out of control lately and there are days when I have barely been able to drag myself out of the front door, even in sunny, joyful Italy. 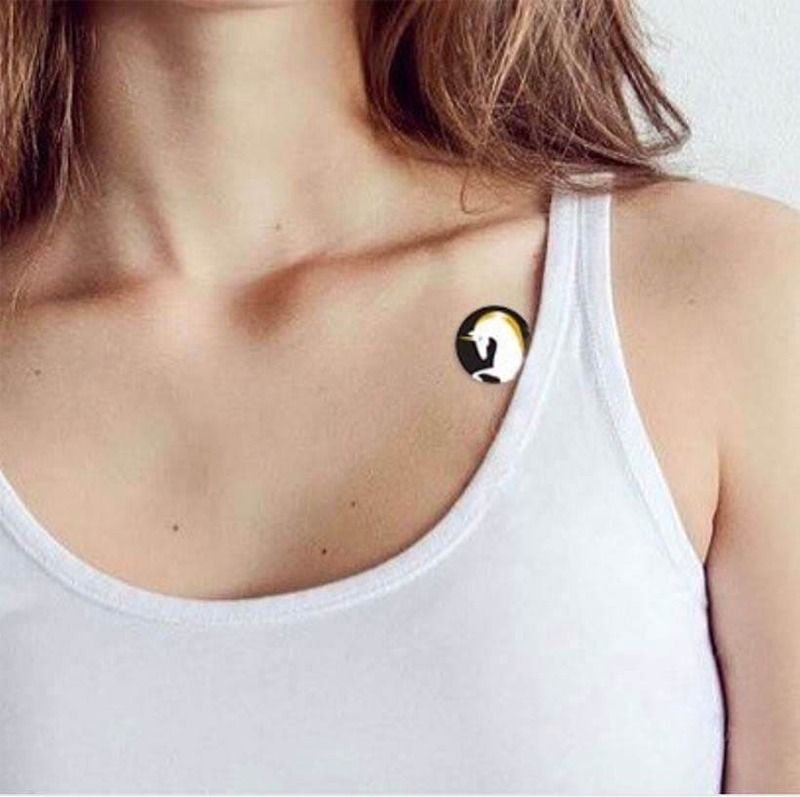 The first time I slapped on Flower Power on the left side of my chest (Body Vibes stickers are to be worn on the left side of the body, near the heart, as energy enters the body on the left and dissipates from the right) I felt a mellow heat suffuse me from shoulder to fingertips. Like a warm fluid flowing through the body. Then I forgot all about it for three days. Three days is the maximum recommended time to wear a sticker… after that, you replace with a fresh one. I repeated the process four times, over 12 days, and though my mind felt less anxious and it was much easier to focus on the tasks at hand, was it purely psychosomatic? So, I stopped applying Flower Power for a week. And that’s when I felt the real difference. My migraines went back to peak capacity, and my anxiety was so through the roof that I was walking the streets of Venice at three in the morning, unable to sit still in one place. My head felt like it would explode. That’s when I realized the power of Body Vibes. And now you will rarely find me without at least a couple of stickers dotted around my shoulders or chest… currently, a cocktail of Beauty and Flower Power. Doctors have long been using transdermal patches to treat a variety of issues, including nicotine addiction, pain, and insomnia. In fact, they were the very inspiration for Body Vibes, with co-founder Leslie Kritzer getting hooked when her husband was given bio-energy discs to help manage his arthritic pain. 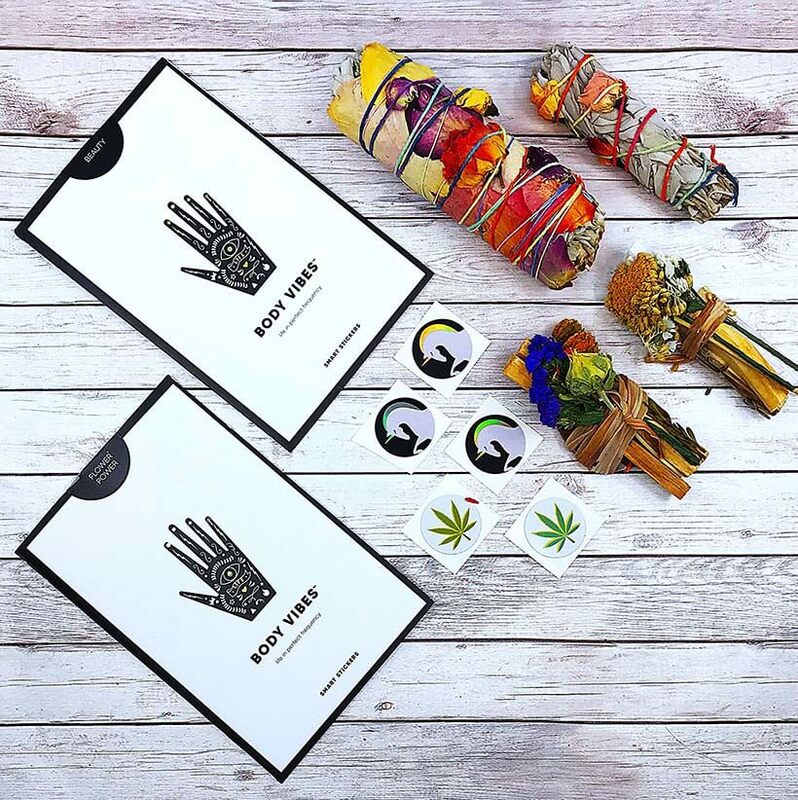 After much research into the field, ranging from homeopathic medicine to energy healing and ancient Solfeggio frequencies, she teamed up with Madison de Clercq and stalked down biological engineer Richard Eaton to help develop the stickers. Body Vibes are now available in multiple frequencies, including ‘Anti-Anxiety’, ‘Energy’ and ‘Focus’. But remember, as with most forms of energy healing, patience and subtlety are key. While I often continue to feel the warmth spreading through my body, and a friend feels a deep tingling whenever she puts on a fresh batch, others have noted no such effects. That’s because Body Vibes are about subtly re-aligning your frequencies… they don’t reach out and grab you by the throat to shake your body into submission. And in a world where we are surrounded by sensory overload and quick fix pills that don’t deliver half of what they promise, I will take these little discs of holistic, chemical-free goodness any time! Have you tried Body Vibes? Do you believe in Energy Healing? « Why Moroccan mint tea is your skin’s secret weapon! I’ve seen these around loads. Had no idea that they’re purpose was anything but for fashion. Such an amazing idea! Excited to try out Flower Power.msounds like just what I need.